Details: You are purchasing 25 grams (pic is of 100 gram bottle) of 99+% Pure Vanillin crystals (synthetic). This is the major component of vanilla bean extract. 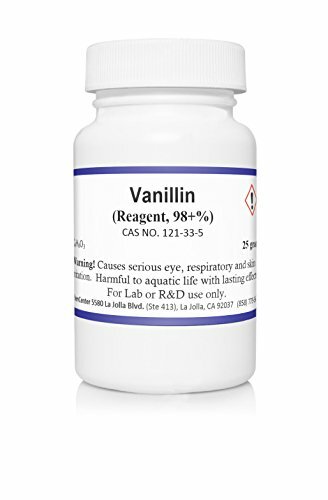 Most Commercial Vanillin is synthetic. YOUR SAMPLE will come from a small drum. Current catalog price is about $25. Buyer must be 21 years of age. Buyer assumes all liability for the use of this item. Buyer agrees to not hold the seller or Amazon liable for the use of this item. This is for laboratory and scientific use only! NOT for food or drug use. Shipping will comply with all USPS regulations. Item is NOT regulated by the DOT.